Uh-oh, it seems Nintendo recaptured its mojo. That could spell bad news for Sony. This Saturday, Tim Tebow leads the upstart Denver Broncos into what should be hostile territory to do the impossible, according to many sports analysts: defeat the New England Patriots in a second round playoff game in Foxboro. 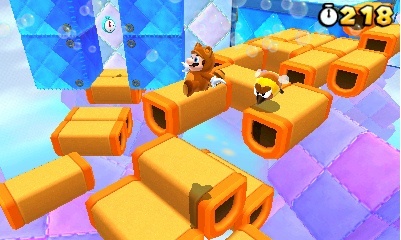 No surprise that 3DS sales exploded once Super Mario 3D Land arrived. Can it be done? Sure. The New York Giants lost to a much stronger New England in 2007, then upset the undefeated Patriots in Super Bowl 42 just a few weeks later. Anything can happen. Seriously, though, few journalists and fans (outside of Tebow maniacs) think the Broncos have a legitimate shot. It would take millions of people Tebowing in unison to pull this off, but make no mistake. The Patriots can lose. In a way, Nintendo reminds me of the Pats. Here's a company/team with a star player (Shigeru Miyamto/Tom Brady). It doesn't appear nearly as strong as in years past. If anything, it's shown considerable weakness, but there's no denying the fact that it's, well...Nintendo. How do you bet against Mario? 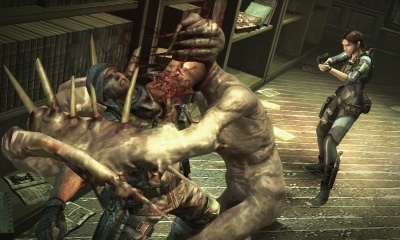 Resident Evil: Revelations kicks off a star-studded 3DS February. Apparently, you don't. Not with 3DS selling hundreds of thousands of systems per week, easily destroying the DS' first year sales in just eight months. Already, the dual screen wonder has at least four one million sellers in Super Mario 3D Land, Mario Kart 7, The Legend of Zelda: Ocarina of Time 3D and Monster Hunter Tri G.
Meanwhile, February looks insane in the States, and in March, Japan receives Kingdom Hearts 3D: Dream Drop Distance from Square Enix. Yes, Nintendo faltered a bit with 3DS initially. Now it looks like the publisher of old, the undisputed handheld king. Sony sits on the other side of the ball, hungry, eager to dethrone the competition, which it tried to do in vain with PlayStation Portable. PSP wasn't a failure by any means, not with over 70 million systems sold worldwide, but Nintendo unloaded more than 149 million DS units during the same period. Allow me to quickly switch sports. In basketball, 149-70 is a route. Not even close. Point being, we're at a critical point where it seems as if Nintendo has recaptured the old magic while at the same time adding some new pieces, like original content via the 3DS eShop. Sony's latest machine, PlayStation Vita, has struggled out of the gate in Japan. This is by no means a death sentence. Sales will pick up once more Japanese centric games arrive, and with the U.S. and European launches closing in (February 22), Sony's bound to have some good news. On the Sony side, Uncharted: Golden Abyss looks incredible. Unlike Denver, though, we cannot envision a scenario where Sony loses yet again, then attempts to smooth things over by praising its opponent. If Tebow goes down, he'll say how great a quarterback Brady is, and how the team was so well-prepared. You'll hear no such words from Sony higher ups concerning the big N.
Vita has all the elements of a dream team. Five-inch OLED screen, two analog sticks, touch screen support, a rear touch pad, two cameras, Augmented Reality...it's the equivalent of 2011's Philadelphia Eagles...built to win now. For Sony's sake, we hope it doesn't befall a similar fate...shattered expectations and not good enough to make the playoffs. To be fair, it remains to be seen whether Nintendo can sell 149 million 3DS handhelds. The market's different, and fierce competition from iOS and Android pose an ever present threat. To that end, and like the Patriots, Nintendo may be ripe for the picking. That is, if Sony can pull the trigger without fumbling the ball. What do you think? Is 3DS already unbeatable, or can Sony pull out the victory?